Homeland security and immigration enforcement have long been important, if not hotly debated, the role of the federal government of the United States. Since the tragic attacks of September 11, 2001, the importance of the job of a Homeland Security Investigations special agent, more commonly known as an ICE agent, has become vital to ensuring the safety of U.S. citizens across the country and around the world. 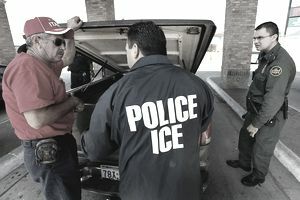 ICE agents work for U.S. Immigration and Customs Enforcement in the Department of Homeland Security. HSI special agents were created after the merger of the Customs Service and the Immigration and Naturalization Services. Homeland Security Investigations special agents work for the federal government in one of nearly 70 field offices around the world. Due to the nature of the job, they may work in a variety of conditions. They may also be required to spend extended periods of time on assignment and outside of their field offices. ICE agents may be asked to conduct all levels of investigations, to include civil, administrative and criminal. The job may require a significant amount of undercover work, infiltrating criminal organizations or businesses to uncover illicit activity. It also involves working closely with other federal agencies, such as the FBI, as well as state and local departments. HSI special agents must have strong organizational and analytical skills. They must also be able to write coherently and clearly articulate thoughts, facts, and ideas. To become an ICE agent, you must be a United States citizen, possess a valid driver license, and not have been convicted of any felony or crime of domestic violence. You must also be willing to live and work anywhere in the United States. This is not a question to be taken lightly since the agency has offices in very remote locations that may cause potential hardships for the unprepared. Preference is given to those who hold at least a bachelor's degree from an accredited 4-year institution. The agency also seeks candidates with prior military service or law enforcement experience and those with the ability to speak one or more languages besides English. In addition, prior experience in a leadership or management position is considered a plus, whether in a civilian, military or law enforcement capacity. ICE agent applicants must undergo a rigorous application process that includes a thorough background investigation, medical assessment, and a personal and structured interview. There is also a battery of tests that measure candidates' experience, reasoning skills and writing ability. U.S. Immigration and Customs Enforcement hold open application periods at various times throughout the year. ICE agents are expected to be in demand for several years to come as threats from foreign terrorists, criminal enterprise, and individuals remain elevated. ICE agents earn a base salary as well as added pay based on the location of their field office. They also earn Law Enforcement Availability Pay (LEAP), which is applied as compensation for the fact that agents will be expected to work an average of 50 hours per week over the course of a year. New agents can expect to earn up to $68,000 per year, depending on their first assignment. Life as an ICE agent can be difficult and stressful. There may be a great deal of travel involved and you must be willing to live nearly anywhere. You must also be willing to enforce all laws of the United States, regardless of your personal feelings about subjects such as immigration.